For most people, the kitchen is the heart of the home. This is where family members and friends gather around to cook, eat, socialize, and spend quality time together. Your kitchen should reflect your personality and feel warm and welcoming. If it doesn’t, it may be time to consider a kitchen renovation. Older homes may come with challenges such as poor design layouts, dead corners, dim lighting, insufficient storage space, limited working space and close concepts. 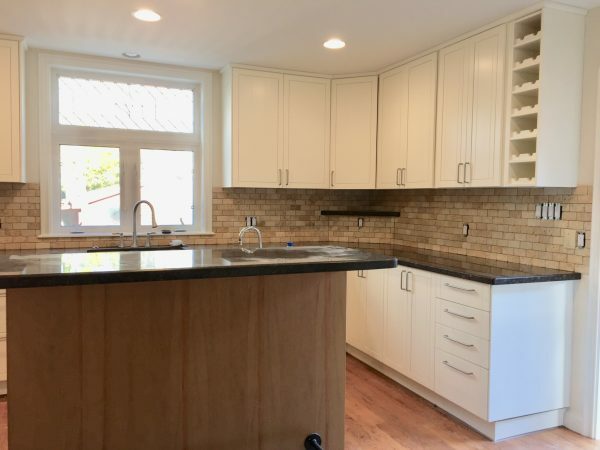 By hiring kitchen renovation contractors in Toronto, you can benefit from affordable and gorgeous kitchen renovation services such as cabinet refinishing. From design to completion, working with a professional renovation contractor like Booth7 can help bring your ideas to life, all while staying within your budget. How Much Does a Kitchen Renovation Cost in Toronto? Whether you need custom work done. A serious kitchen renovation can cost thousands, and some homeowners will spend tens of thousands! Not everyone has the budget for such expensive renovations. That’s where kitchen cabinet painting and refinishing comes in. By choosing a trustworthy kitchen renovation contractor who can refinish your existing cabinets, you will be able to enhance the look of your kitchen with a few simple but effective changes and stay within your budget. Kitchen cabinet refinishing is a more affordable way to breathe new life into your kitchen. It usually costs anywhere from $200 and $3,000 for materials and $500 to $3,000 for labour. Most homeowners on average end up spending about $2,400 in total. Meeting with a reliable contractor will help you figure out which parts of the kitchen renovation project you need to do right away, and which changes you can complete over the next few months. You may think you need to replace your existing cabinets and install new ones, but really, you may only need to have the surfaces refinished to transform the look of your kitchen. With expert advice, you’ll be able to make the right decisions that are FAR more cost-effective. If you are looking to give your kitchen a beautiful facelift without the hefty price tag, refinishing your cabinets is a great option. At Booth7, our kitchen renovation contractors, and our team can help you make wise decisions about renovating your kitchen. Our experienced team offers high-quality, professional kitchen cabinet painting and refinishing services and excellent customer service. Our services also include a free in-home consultation, competitive pricing, and custom designs if required. We handle all the details of your project from start to finish, so you easily manage communication, and trust you are in good hands! To get started on your kitchen renovation and have your cabinets refinished, please fill out our online form or contact us at info@booth7.com. Our staff with respond to your inquiry very quickly and always within a few hours. Have an idea of what you want your kitchen to look like? Send us images of your existing kitchen and get a free consultation and estimate today! To learn more about us, our services, or to request a free consultation and quote, get in touch with us today at BOOTH7!